Today marked the 100 year anniversary of the sinking of the Titanic. This isn’t the kind of thing I would normally know about. However, due to a silly turn of events (forgot to charge phone last night; had to save battery and so chose not to listen to music on iPhone on way to class, therefore turned on radio) I happened to catch part of Bob Edwards’ (NPR Morning Edition) interview with the author of the book Unsinkable: The Full Story of the RMS Titanic by Daniel Allen Butler. While I’m sure these passengers quickly came to terms with the inevitable sinkability of the vessel, it struck me as an interesting snapshot of the human experience from 100 years ago. How often in my life have I chosen to believe what I was told- or what I wanted, intellectually, to believe, rather than what my own senses were telling me? The “ego mind”often has much to say that the “body mind” or “gut feeling” would contradict, if we would just listen. On the mat- if you’ve ever injured yourself by pushing a little too far in a pose, you know what I’m talking about. Off the mat? Ugh. Don’t get me started- if you’ve ever pursued a bad relationship even when your heart was telling you it was trouble, you know what I mean. This week in my practice- on and off the mat- my intention is to listen to my instinct, to my gut, to what my senses are experiencing. With any luck, I can dodge an iceberg- or at least be aware of the collision. 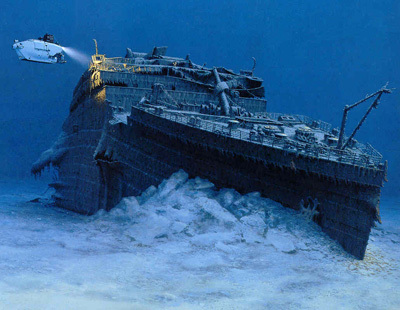 This entry was posted in Uncategorized and tagged instinct, titanic, trust your gut, unsinkable: the full story of the rms titanic on April 14, 2012 by laurasana.